Are you an illegal? A felon? A stoner? A homo? Then take Gov Jerry Brown's and LtGov Gavin Newsom's perversion of Horace Greeley's "Go West, Young Man" and go to Moonbeam-o-topia...formerly known as California. 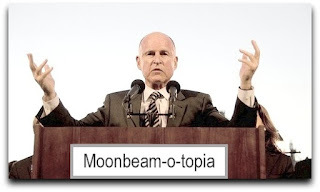 - The once 'Golden State' has become the nation's foremost open air exhibition of failed Socialist policies, illustrating the consequences of Democratic (C) rule.